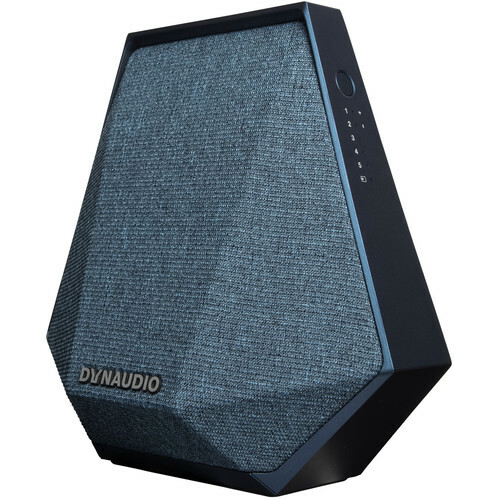 Enjoy wireless audio streaming with the blue Dynaudio Music 1 Wireless Speaker. It outputs up to 80W of total power using its 4" woofer and 1" tweeter. Bluetooth with aptX technology allows you to pair and wirelessly stream music from your compatible devices, such as smartphones or tablets, while onboard Wi-Fi connectivity enables wireless streaming from a variety of sources, including Internet radio, AirPlay, and your DLNA devices. The Music 1 also features a 3.5mm input for wired devices and a USB port for charging of and playback from compatible iOS devices. RoomAdapt technology automatically adjusts the tone to the speaker's placement in your room, and NoiseAdapt technology tweaks the sound to help keep it audible among ambient noise. The built-in battery enables up to 8 hours of wireless playback. The Music 1 can be controlled by the Dynaudio Music app, which is free for iOS and Android. The free Dynaudio Music app for iOS and Android connects to a variety of music-streaming services. The speaker has five presets that can be filled with anything accessible from the app, such as Music Now playlists, internet radio stations, individual songs, dedicated presets for different family members, and more. Just press the button of the desired selection and listen. It doesn't matter if you place the speaker in a corner, up against a wall, or standing in free space; built-in RoomAdapt technology is designed to sense where it's placed and continually optimize the speaker's tonal characteristics for clean, accurate bass and midrange. NoiseAdapt technology helps keep essential musical details clear, even when the room is noisy and the speaker volume is low. You won't need to adjust the volume or tone based on the noise level in the room, because the Music speaker does these adjustments automatically. The Music speaker can stream via Wi-Fi, aptX Bluetooth, or Apple AirPlay, and access your DLNA-compatible devices on your home network. It has a USB input for charging and playing back audio from iOS devices and also accepts an 1/8" analog input for near-universal wired support. Up to six speakers can be connected at once and arranged into multiroom groups or controlled individually from the Dynaudio app. EQ presets include Music, Movie, and Voice, while tone control is available for bass and treble. Box Dimensions (LxWxH) 13.2 x 12.1 x 10.1"